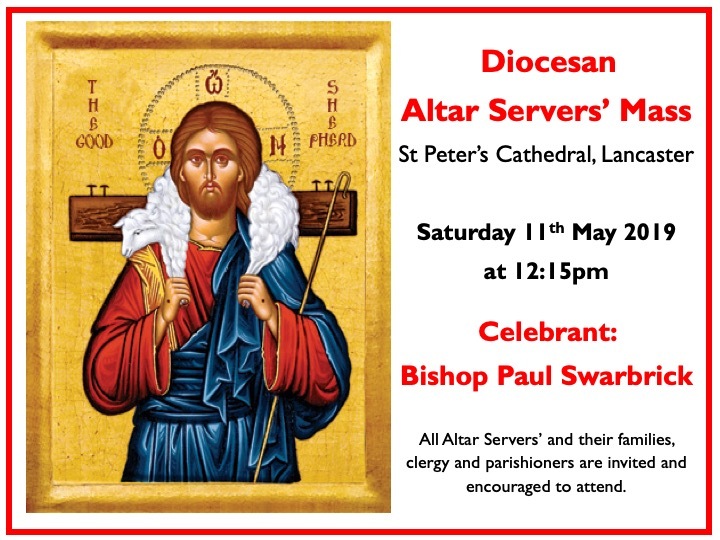 I write to invite you, your servers and their families, friends and parishioners to the Cathedral in Lancaster for the Altar Servers’ Mass on Saturday 11th May, 2019. Our Bishop will be the main celebrant for Holy Mass. The Mass would also be the first main opportunity, in the year of the Eucharist (being held in our diocesan schools) and following on from the Eucharistic Congress “Adoremus” for the servers to meet collectively with the Bishop. – From 11.45am servers (bring your own cassock and cotta etc) vest in the Cathedral Social Centre on Balmoral Road. – 12.05pm. Leave to join the entrance procession. Mass begins at 12.15pm. – Afterwards light refreshments (tea, coffee, biscuits etc) will be served in the Cathedral Social Centre but servers are invited to bring a packed lunch with them. I would be grateful if you would particularly encourage servers and their families to attend. Please could you let Ian Mulholland know asap but by 1st May, 2019 the number that are coming. He can be contacted on mulholland.id@gmail.com or on 07944857813.